Last week, ABC announced that it would not be picking up Marvel’s Most Wanted, the Agents Of S.H.I.E.L.D. spin-off spotlighting Bobbi “Mockingbird” Morse and her ex-husband Lance Hunter. 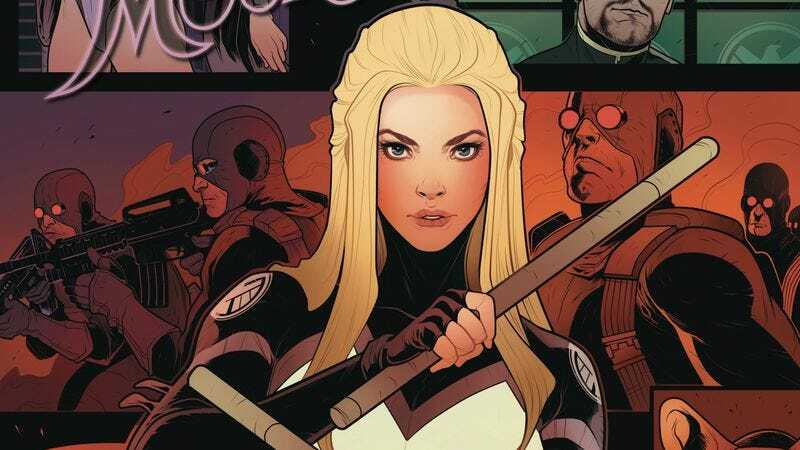 But fans of the characters should seek out the new Mockingbird comic series by writer Chelsea Cain, artist Kate Niemczyk, and colorist Rachelle Rosenberg. Cain did exceptional work with last year’s Mockingbird one-shot, and she’s crafted a captivating superhero spy story in Bobbi’s ongoing series, using an unconventional structure to build a strong sense of mystery. The first issue detailed Bobbi’s increasingly fraught trips to the doctor over the course of a month, and each subsequent chapter delves into what Bobbi has been doing for a different week of that month. The reader knows where the narrative is headed but doesn’t know the details of how it gets there, and while some may have been confused by the first issue’s big jumps, that structure has helped add a lot of tension to the plot. That tension is balanced by a sharp sense of humor, and these preview pages of next week’s Mockingbird #3 reveal how Cain juggles comedy and drama in her script as Bobbi flies to the rescue in a hostage situation started by a superpowered 12-year-old girl. Kate Niemczyk is a newcomer to the comics industry, but she’s shown a lot of potential in the pages of Mockingbird, detailing Bobbi’s adventures with a clean, expressive style that maintains the strong graphic elements that characterized Joelle Jones’ art on the Mockingbird one-shot. Rosenberg’s coloring adds dimension to the linework, and her vibrant palette brings extra energy to the page. This creative team of women is clearly passionate about the character and story they’re working on, and hopefully they’ll have plenty of future opportunities to continue telling the thrilling tales of Bobbi Morse.